Without New Jersey's Watchung Mountains and the towns around Morristown, would the American Revolution have succeeded? Would George Washington's army have survived? circumstances and geography of this region during the War of Independence. It is an account of American history that has been overlooked and overshadowed until now. But this "geological fortress" - Washington and the Continental Army's winter quarters for four years -- may well be the place where America survived. 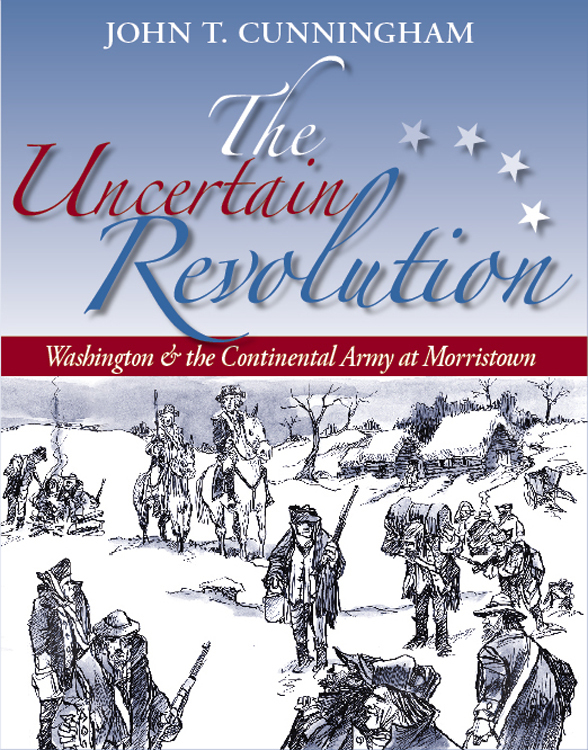 In The Uncertain Revolution, John T. Cunningham tells the story of those forgotten winters in Middlebrook and Morristown and of their critical importance to the course of the war. Geographically, the mountains made an excellent defensive position, hiding from the British the disarray of the American army and the horrific conditions. Reports of the strength and numbers of American troops fluctuated wildly as Washington and his officers tried to stave off desertion and mutiny. Washington's army survived a small pox epidemic at Morristown, a season of short supplies at Middlebrook, the most brutal winter of the war in 1779-80, and the war's most dire mutiny on New Year's Day 1781. There's drama -- including the cat-and-mouse game played with the unpredictable British general, George Clinton, and treachery -- with one of his favorite officers, Benedict Arnold. There's also the fierce performance of the New Jersey militia in defense of their homes and farms. In The Uncertain Revolution, Cunningham makes the case for the importance of Morristown and the mountains to an understanding of the war itself. And just as the history of those harsh winters has long been neglected, so were the physical places over time. The soldiers huts in the mountains at Jockey Hollow disintegrated, and the houses that had served as Washington's headquarters were almost lost to neglect and development. The author's account of their reclamation and eventual incorporation into the America's first National Historical Park in 1933 is a fitting conclusion to his story of Washington in the Watchungs. Victory in the American Revolution was insured more by a series of fiery, volcanic eruptions 150 million years ago than by the military genius of George Washington or the valor of his often uncertain soldiers. The eruptions sent several waves of molten lava streaming across barren land to form what are now New Jersey‚s Watchung Mountains, the American Revolution‚s most formidable natural bulwark. The two outer Watchung ridges, like the outer walls of a tremendous fortress, rise as high as 879 feet above sea level, just north of what is now Paterson. Elsewhere along the top of the basaltic formation the ridges are between 450 and 600 feet high. Considering that sea level is less than eight miles from the outer ridge, the rise of the formation is precipitous, and in places, cliff-like. Geological time also saw an ancient ancestor of today‚s Passaic River carve out a deep gap in the ridges, midway on a straight line between Morristown and the lower tip of New York. The location of the gap is uncanny, considering the role it was destined to play in American history. There were lesser gaps to the south, but none offered an easy or convenient passage through the ridges. The major gap, usually known as the Springfield Gap, could be defended easily by sharpshooters or light artillery posted on the top of either side of the opening. The British made only two anemic efforts to pass through the opening, in the autumn of 1777 and at the end of the Battle of Springfield on June 23, 1780. Both were quickly repulsed. It should be evident that the emerging United States could only be conquered by whichever side controlled or neutralized New York and Philadelphia. The corridor and roads linking the cities ran for a considerable distance within easy view of the Watchungs. The countryside as far away as Sandy Hook could be monitored from heights in the southern part of the mountains. The Watchung ridges were a perfect refuge and vantage point as long as the British command maintained its headquarters in New York. The British left only once during the war, in 1777, when General William Howe took his army to Philadelphia for the winter. Washington immediately broke camp to follow the enemy south, eventually wintering at Valley Forge. Historians disagree on why Washington took his army north after the electrifying triumphs at Trenton and Princeton at the end of 1776 and the beginning of 1777. It is true that he had little other recourse, but his many civilian years as a surveyor and his reliance on map makers surely made him aware of the strategic value of the Watchung Mountains. He did not command by whim. Copyright © 2007 John T. Cunningham and Cormorant Publishing. All Rights Reserved. John T. Cunningham has long been known as "New Jersey's popular historian," a title bestowed upon him by the New Jersey Historical Commission. His prolific contributions to state history in his books, magazine articles, documentary films and talks demonstrate that he knows, writes and talks about his native state from experience and diligent research. The Uncertain Revolution is his 50th book. His first, This is New Jersey, published in 1953, has never gone out of print. Well known in the state's schools, his extensive program of New Jersey studies features the noted text, You, New Jersey and The World. One of the founders of the New Jersey Historical Commission, he has served as its chair, and was also president of the New Jersey Historical Society. Rutgers University, in bestowing an honorary degree on Mr. Cunningham, called him "Mr. Jersey." The New York Times said: "He helped to give New Jersey legitimacy." With years of experience as a reporter on a major New Jersey newspaper, Mr. Cunningham considers himself to be a historian who approaches his writing with a journalist's quest for truth combined with a style accessible to all readers.